Carlos Slim Helú was born on January 28, 1940). He is a Mexican business magnate, investor, and philanthropist. From 2010 to 2013,Carlos Slim Helú Slim was ranked as the richest person in the world.The position was regained by Bill Gates in 2014 .Slim has reclaimed his position as Worlds Richest person again on this July 15, 2014. Bill Gates is the former chief executive and chairman of Microsoft. He is the world's wealthiest people in the Forbes list consistently from 1995 t0 2007. He was the wealthiest American and the world's second wealthiest person. As of June 2014, he is still the richest but Carlos Slim occupied his position this july. Amancio Ortega is a spanish fashion executive and chairman of inditex Fashion Group. He was ranked as the world third most richest person in the world according to the forbes list with the net worth of $65 billions. Warren Buffett is the American Business Magnet and Investor. He is the CEO and Chairman of the Berkshire Hathaway. He is listed as the worlds Richest person in 2008. 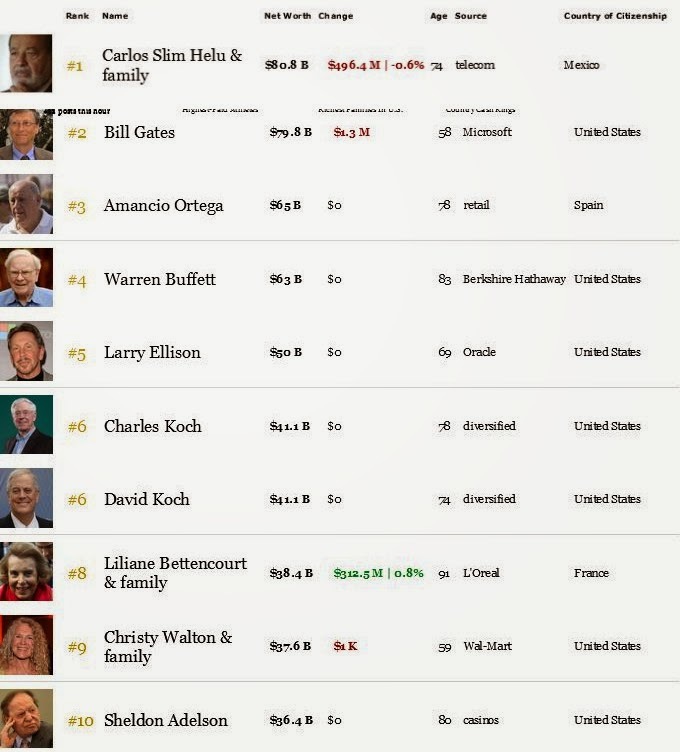 Now, He has net worth of $63 Billions from all properties and Shares which ranked 4th in this list. Larry Ellison is the Co-Founder & CEO of the ORACLE Corporation. According to the Forbes, He is the third most Richest persons in America behind Bill Gates and Warren Buffett. He is listed as the world 5th most richest person with the Net worth of $50 Billions. Charles koch is the American Businessman. He is the CEO of the Koch industries. He owns 42% of shares of the conglomerate. Forbes listed him as the 6th richest person in the world with the Net worth of $41.2 Billions. David koch is a American Businessman. He is the Executive Vice President of the Koch industries. He owns 42% of shares of the conglomerate. Forbes listed him as the 6th richest person in the world Sharing with his brother Charles koch with the Net worth of $41.2 Billions. Liliane Bettencourt is a French Businesswoman. She is one of the principle share holders of the L'Oreal.Forbes listed her as the worlds richest woman and 8th most richest persons in the world with the net worth valuing 38 Billion USD. Christy Walton is the founder of Walmart. According to the forbes she is 5th richest person in the United states and 9th worlds richest person with the net worth of $37.6 Billions. Sheldon Adelson is the CEO and chairman of Las Vegas Sands Corporation. According to forbes, He is world's 10th most richest person with the net worth of $36.4 Billions. Note: The Data updated based on the listings of Forbes and its valid as of JULY 2014.